I've seen all the other threads but none of them discuss removing the tensioner assembly, only the pulley. Aside from removing the alternator, heater/coolant hoses, where are the bolts securing this to the block and how many are there? I honestly didn't see any today when I had the alternator off. Looks like a write-up is in the making. Having said that, their engineering drawings are not what they used to be, but I'm seeing 2 long bolts that face into the front of the engine from the passenger side of the car: One just aft & below the rear heater-pipe connection and one that looks like it is probably hidden behind the tensioner pulley... There appears to be a third set of holes above the pulley, but they don't show a bolt going thru them. Beyond that there are the usual warnings about being careful with (or better yet, replacing) the plastic elbow between the bracket and the intake manifold, and getting new O-rings... I've reused the O-rings where the heater-pipes connect with the bracket/tensioner, as you can easily replace those anytime, but you'll definitely want new ones for the rear and elbow connections. Anyone out there whose actually done this job got anything to add? I followed the instruction in the manual and replaced the parts you mentioned, the plastic elbows and all o-rings. I just never re-use an o-ring on anything. It's a habit and training taught me that. Not that it is the only way it is just the way i do it. Would hate to finish a job and have an o-ring leak from being deformed. Wasn't too difficult as i remember. 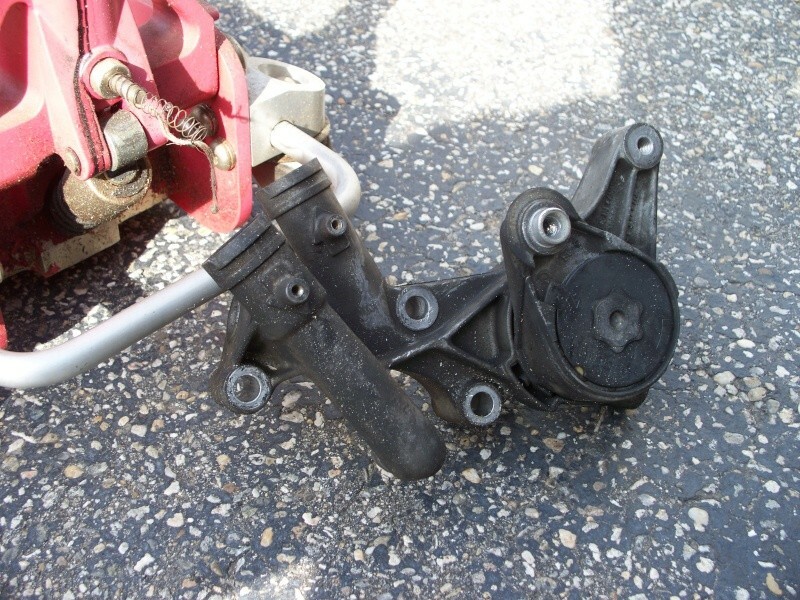 As I said, "as you can easily replace those anytime, but you'll definitely want new ones for the rear and elbow connections." I just noticed this attempt to bust my balls. When i get airborne I certainly don't want ANYTHING to fail, certainly not a $0.50 O-Ring. I was trying to join you in the wonderful world of flight! If I had my way, babe, I'd have my own L-1011... The most advance and safe bird of its day. If we both flap are wings, we can pretend that we are not only wealthy enough, but crazy enough to fly.!!! Thanks for the tips. I've actually been watching a set of service manuals as of a couple days ago. Is this plastic elbow a dealer only item? I assume so. I believe the holes above the pulley are for the alternator. You can get the plastic elbow at almost any parts store in the 'HELP' items. A lot of stores don't even know they have them on the shelf. I just did this on my Riviera. Write-up forthcoming although it was pretty easy. One plastic coolant elbow, some red RTV and some coolant. I'll get the part number for tensioner assembly I used (Gates for $45/shipped on Amazon) and go through the motions. Probably post it by weekend. Oh... the Gates tensioner came WITH the elbow. How cool is that? I'll explain where the bolts go for just the tensioner and where it bolts to the alt. Also the coolant lines and where they go. I was happy with how easy it was. Okay.... So Aaron had a similar write-up for replacing the SC tensioner assembly but I couldn't find one for the accessory one. Like him, I was getting odd chirping sounds one morning where there was excessive dew and when it rained. The squeaking wasn't crazy but enough to get annoying. After reading his description and speaking with him about it, I decided to change out mine. The result is no more noise. Onto the write-up. Here is a pic of the engine bay where you will be working. 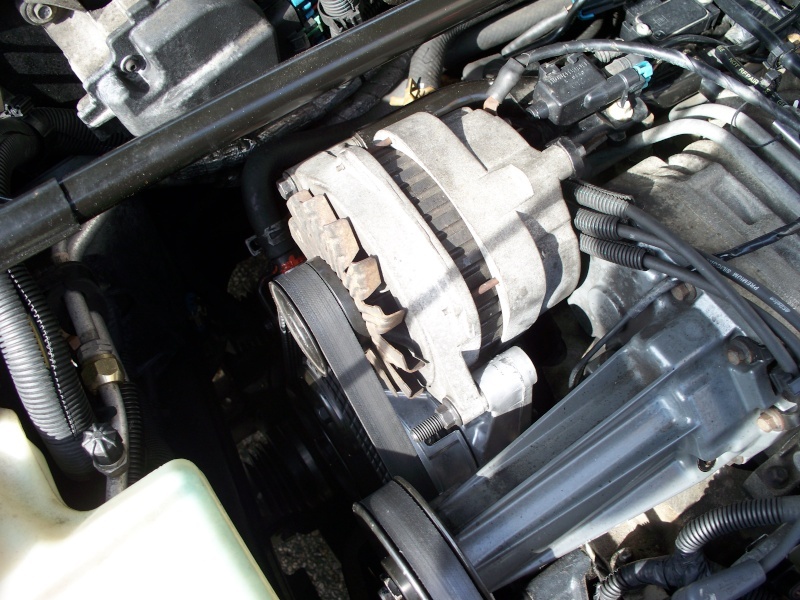 You can see the bright shiny new tensioner sitting below the alternator. First, disconnect the battery. It is located underneath the back seat. 8mm socket (i believe) loosens terminal bolts. Second, you will want to drain the coolant out. Climb underneath the car and pull the push pins off the front valence to reveal the petcock on the radiator. It is located on the driver side. I believe the size of the bolt on it was 19mm. I had a 7quart low profile pan to put underneath while it drained. Next, you will want to release tension from the accessory belt. 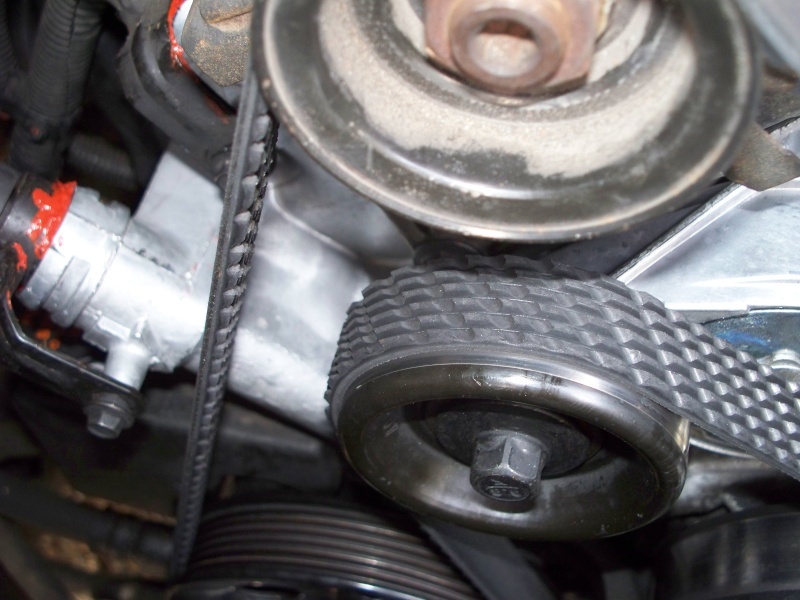 You can do this by using a 15mm socket on the pulley underneath the alternator pulley in the picture above. 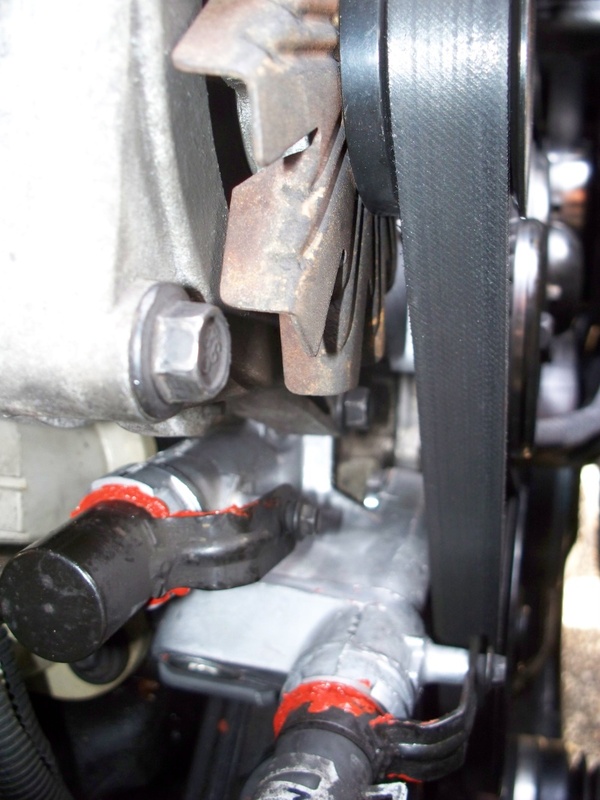 Turn the ratchet towards the firewall and that will give the belt enough slack to slide off the pulley. Okay.. Alt is out. You have a pretty good view of the tensioner assembly. Here is a pic of my old one so you can see what it looks like: This should give you an idea of where the coolant lines run and where the additional bolts go. You will notice that a couple of the 13mm bolts you already pulled for the alternator attach that to the tensioner. There are a few more 13mm bolts that need to be removed as well as two 10mm bolts for the coolant lines before the assembly can be taken out. Once you remove all of them, you also have to contend with the coolant elbow that runs from the tensioner to the lower intake manifold. 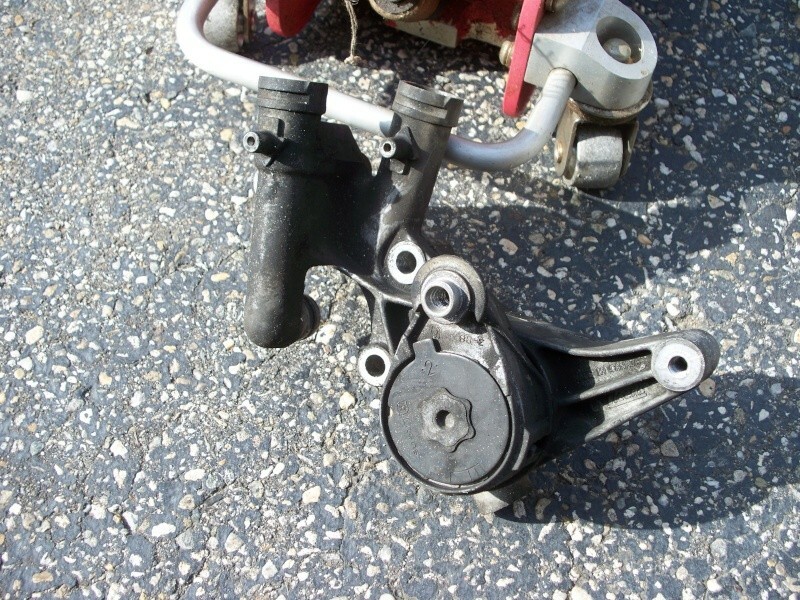 I just jostled the elbow out of the manifold first and then pulled it from the tensioner. The old elbow broke off at the ends in both parts so it is imperative that you have a new one on hand to replace. I used needle nose pliers to get the pieces out of the intake manifold. It wasn't terrible. The pliers I used had a bend to them so I was able to get behind the broken parts and just pull them out. Worked great. The coolant lines will come out pretty easy if you twist them a little back and forth. Since you drained the coolant, there shouldn't be much of any leaking out when you pull those lines. I want to make quick mention that this install should be pretty easy when you see the tensioner unit that was sent to you. When I took that out of the box, I was able to quickly see what went where so I wasn't flying blind... so to speak. For the coolant lines that are pulled, I cleaned the surfaces off that go back into the tensioner and tacked on some red RTV silicone to where the o-rings are just to make sure they make a good seal. I let them sit for about 30 mins before reinstalling. For the coolant elbow, I did the same thing... just added some RTV around where the o-ring sits to ensure there is a decent seal. I tacked the RTV with my index finger and thumb to give it a little texture. Next reinstall everything the opposite order of taking apart. Take your time and you should be fine. 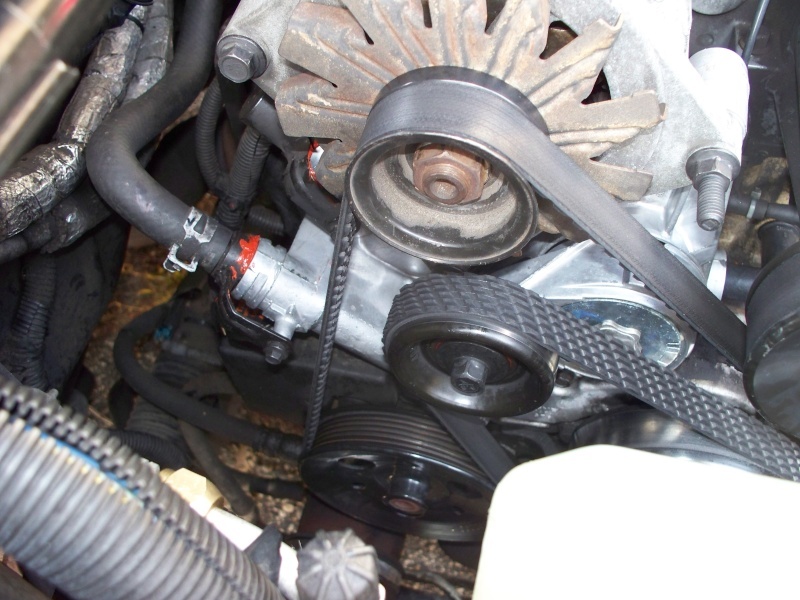 If you want, you can use the tensioner pulley that comes with the unit or re-use your old one. Since I previously had a metal pulley, I opted for reusing that. Note: to remove the pulley, turn your ratchet towards the radiator. It's a reverse threaded bolt. You will need to bleed coolant system of air. You can do it a number of ways. I just ran the car for a few minutes with the radiator cap off. Then turned car off. Let it sit for a bit and put the cap back on. Ran it again and then bled the last bits of air out through the stat housing. I'm sure there are better ways but this is what I did. If the reservoir looks low after bleeding the system, make sure to add some fluid to that. I think that's it but I'm sure I left parts out and took too much detail to others. I'm going to attach more pics at the bottom to provide a little more perspective. Please post here to let me know where this is deficient and I will add more info. One thing I would have done differently - get new O-rings and use some grease and they will be fine. Don't RTV the O-rings or you are completely screwing somebody down the road. Otherwise nice write-up. I gave you a plus. Great photos!! At last, we can see exactly how this thing is plumbed. The "external", non-elbow passage plugs into the front of the head, right? I do agree with Deek about the RTV - I've already pulled the heater-hose pipes once to get at the spark plugs, and after cleaning and lubing with a little fresh anti-freeze I re-installed them and the O-rings don't leak. That brings up another question, though: Did the elbow and the 3 other coolant fittings on the tensioner come with new O-rings? P.S. - Derek, your 'plus' didn't take hold... There was no green stripe until I put my own vote in. All of the coolant fittings came with new o-rings. I've taken apart things that have silicone gaskets before and aside from the cleaning of the surfaces, the whole process of pulling the surfaces apart was easy. After all... it's just high temp silicone. ahh that would be the intent not actually triggering the deed. It is done now. Does the plastic elbow come with all new accessory tensioners? Can you see the elbow in any of the pictures? 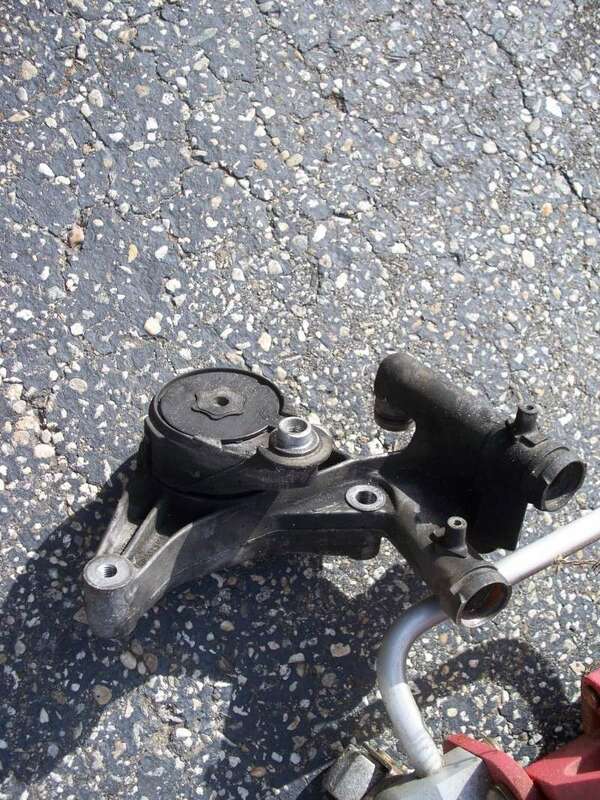 The tensioner DID come with the elbow which I thought was nice. Good ole' Gates and their fantastic parts. You can see the elbow in the first pic I posted. Follow the accesory belt from the alt pulley to the right edge of the picture. You will see the elbow just above the SC pulley. I can take another pic as the car sits now for a better view if you want.